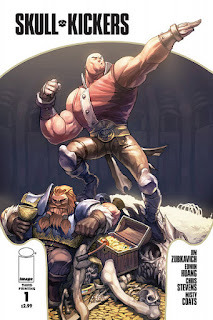 I first learned of a comic book titled Skullkickers around the time issue four was being solicited, (October 2010 I think), but hadn't really heard anything what the book was about until about a month later. If I remember right I had heard Vince B mention the series on the 11 O'clock Comics podcast so I had to check it out and I chose wisely to do so. Skullkickers is the tale of two mercenary monster slayers and their journey to find fame, fortune and adventure. Think Conan mashed with Lethal Weapon and you get the gist of it. Jim Zubkavich (Zub) is the co-creator and writer of Skullkickers and you can find out more about him in his own words here. Skullkickers came to be when Jim and artist Chris Stevens did a story for the Image Comics anthology series, Pop Gun and would eventually became an ongoing series. Everybody that reads whether it be prose or comics have favorite writers that they gravitate to for one reason or another. I had been out of comics for long time and the last writer that had an impact on me was Walt Simonson and his run on Thor. When I read the first arc of Skullkickers, there was something comfortable and familiar about it. An action packed comedic bromance in a fantasy setting, it was exactly like many of the Dungeon & Dragons sessions I've played in had gone. As it turned out, Jim has a history of playing sci-fi/fantasy roleplaying games. Aside from writing Skullkickers, Jim is working on his own series of original graphic novels titled Makeshift Miracle and is also writing the Pathfinder comic based on the roleplaying game of the same name. This is going to be series of posts on these titles with love going out to the people that work with Jim: Shun Hong Chan, Marshall Dillon, Misty Coats, Edwin Huang, Chris Stevens and Andrew Huerta. Coming up first will be the story "2 Copper Pieces" which started it all.